Nami Sato Imaizumi is a native of Miyagi Prefecture, Japan. She is a former FIFA Referee on the Japan Football Federation panel from 2008-2016. Nami’s international officiating career includes the Asian Football Confederation (AFC) U-16 Women’s Championship Qualifications (2008, 2010, 2012, and 2016) and the AFC U-19 Women’s Championship Qualifications (2012, 2014, and 2016). 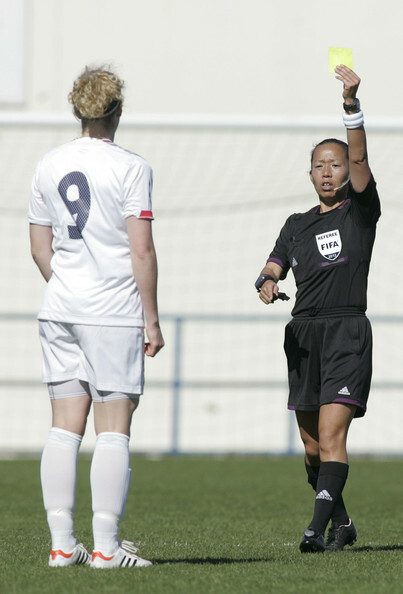 She has also officiated at the 17th Asian Game in Inchon, Korea, in 2014, and at the Algarve Cup, in Portugal, in 2012. Nami was also appointed to referee the final match of the South Asian Football Federation Women’s Championship in Bangladesh (Referee). In 2012, after taking charge of five games at the FIFA Women’s U-20 World Cup, she was appointed as the Fourth Official for the final match. Nami’s refereeing career dates back to 1994 when she received her Class 4 license in Japan. Ten years later, in 2004, she was selected to be on the Class 1 Women referee list by the Japan Football Federation (JFA). In 2010, Nami was promoted to the Women’s Division I list. Until she retired from refereeing in Japan in 2017, she refereed 210 games for Japan’s top women’s league. In 2016, she was selected to referee the Final of the Empress Cup which determines the best women’s team of the year. She moved to the U.S. in 2012. She is married to Morinao Imaizumi and live in Tallahassee, FL. Her husband Morinao, is an assistant coach of the current NCAA Div 1 National Champion Florida State University Women’s Soccer team. Nami is honored to be selected as a US Soccer National Referee Coach and is determined to share her experiences with many aspiring referees.